Feelings, especially on the negative spectrum, can be overwhelming, distracting, even numbing. Often we just don’t have time to deal with them, so we turn to food, drinks, TV, work, etc. Moreover, society has taught us to swallow and smile and pretend everything is ok, but repressing our emotions can lead to further problems. Emotions have energy behind them and they can build up and cause problems later. For example, we might get to the point when we just can’t take it anymore and explode, which affects the people around us and often leads to tensions and regret. Sometimes even physical problems can manifest as a result of unexpressed emotions. Repressing anything (or anyone) does never work in the long run as it builds up pressure and tension. Instead, we could reconnect to our body, see how it feels and let out what doesn’t serve us. After all, we are all human beings with feelings so let’s embrace our emotions and our deepest humanity. The questions arises, how to do that safely, without snapping at people around us or crying uncontrollably in public. I’m NOT suggesting that. Yet, we can start by acknowledging how we feel and stop the distraction. Personally, I’m a big fan of breathing techniques, which help to let go of the energy behind the emotion. For instance, focus on a particular feeling (or a person that triggers a negative feeling) and breathe it out (long and slowly), then imagine breathing in (long and slowly) something positive, such as the energy of peace, forgiveness, calmness, etc. Then with the outbreath, let go of the old negative emotion, followed by breathing in the positive. Visualise it, connect to it and focus on it for several minutes. Notice how much better you feel after 5 minutes, not to mention that the additional oxygen helps you think more clearly. A second very effective technique for deeper emotional challenges is EFT tapping. Tap on the meridian points which are part of our energy system (as in Traditional Chinese Medicine – Acupuncture points) while focusing on the particular distress. If you’re new to EFT, perhaps work with a practitioner or join a group. 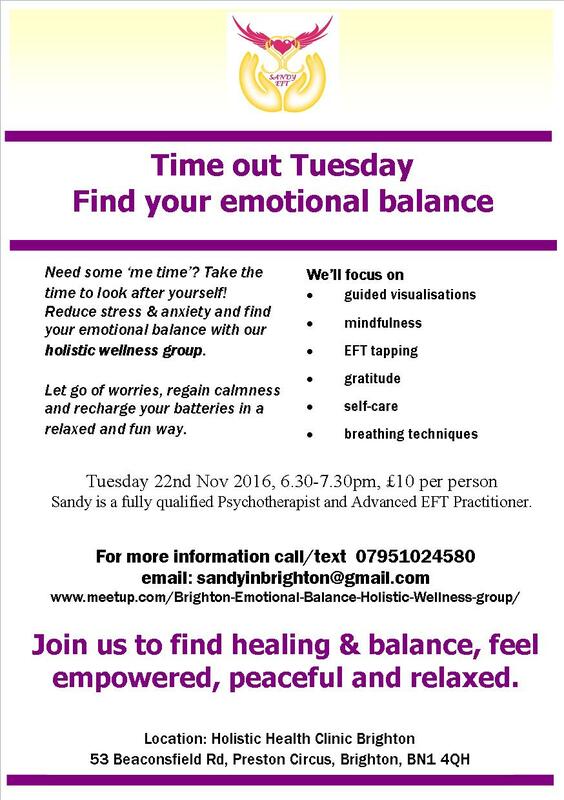 If you’re based in Brighton, Southeast England, you can join the weekly emotional balance group (Time Out Tuesday) starting soon. The key is to become present and connect to your body, acknowledge how you feel and find a safe way to let go of those emotions. Doing this regularly will increase your wellbeing. You’ll become lighter, happier and more balanced. Free yourself and find your inner balance. Nurturing yourself is important, especially in times of stress. A great tool that I highly recommend is doing daily affirmations. Affirmations are positive statements. Louise Hay, the queen of affirmations, has written lots of books about the topic. She recommends looking into your own eyes in front of a mirror while making positive statements about yourself. Starting with that first thing in the morning is a great way of setting you up for a positive day. Think of a few things you like about yourself and tell your reflection in the mirror. Or try and see yourself through the eyes of someone who loves you. Be nice to yourself and acknowledge how far you’ve come. Remind yourself of all the many good qualities you have. It doesn’t take long to do the mirror work. Having a positive self-image is crucial if you want to shine and make a difference. If you notice any resistance coming up, declare your statements as a process, e.g. ‘I’m feeling better and better each day.’ ‘I love myself a bit more every day.’ or ‘I love learning how to relax’. Another way of addressing any resistance that comes up is EFT tapping. If affirmation bring some of your subconscious core beliefs onto the surface, face and acknowledge them while tapping. This is really powerful. I hope you’ll take a few minutes each morning and evening focusing on your positive qualities and looking after yourself. You’re ok just as you are and when you become your own best friend, nothing can stop you. Take care of yourself and see how the world will do the same. Be willing to take risks is surely necessary on the way to creating your best possible life. Yet there might be a little old friend that keeps sabotaging the best attempts. At least that’s the case for me. Every person might have their own little inner saboteur, for me it’s procrastination. We are old friends and we go way back. Today, however when reflecting on ‘our friendship’ I’ve decided that it’s not going to work anymore. I need to move on rather than being slowed down. I choose to bond more with some of my new friends, such as ‘motivation’, ‘excitement’ and ‘action’. It’s my life, right? So I can choose my ‘friends’ and it definitely feels better to surround myself with positive friends who are helpful and encouraging and who don’t aim to hold me back. It’s not easy to let go of old habits. When using EFT (tapping) to help me let go, I realised why I was holding on to it. It was a safe place, a habit which provided me with comfort. I didn’t know any better, so rather than fighting it, I can now accept it for what it was and let go (*tap tap tap*) Dear old friend procrastination, I know you’ve just been a ‘safety mechanism’ trying to protect me from harm, from rushing into things and from becoming overwhelmed. I thank you for your service and I release you now. I’m now ready to hang out more with my new friends. We love doing ‘Positive EFT’ together (meaning that you tap on positive things such as ‘motivation’, ‘excitement’ etc. and really feel into that). Feels great! Gosh, I’m so motivated right now, I could write a book. But hey, in case you’re procrastinating while reading my blog (thanks for stopping by) I dare you to tap on your little inner saboteur (click here for tapping points and more info on EFT) and create the life you’ve always wanted. You deserve it. P.S. I wrote the above in February 2014 and just wanted to share that the tapping really helped. I have come a really long way in the last two years, and have in fact managed to write (co-author) a book since, been living and traveling abroad for the last 7 months, completed a 1 year diploma course and qualified as a Psychotherapist and Hypnotherapist, became an advanced EFT practitioner, have run EFT workshops, have worked with a Chiropractor to treat people with chronic pain and have helped people from the UK, Germany, Hungary, Australia, Switzerland, the United States and a few more with a great variety of issues. I’m grateful for my life and still keep tapping. It really works, so I’d like to encourage you to try it too. For more information see my EFT site. It’s easy to learn yet if you feel you need any support, I’d be happy to work with you. I offer sessions via Skype and will offer workshops and face-to-face treatments again from Juni in Brighton, East Sussex, UK. You can contact me via email: Sandyinbrighton@gmail.com or fill in the booking form on my EFT site. Anyway, wishing you a wonderful and productive day. Love and light from Thailand, where I’m currently living. ?